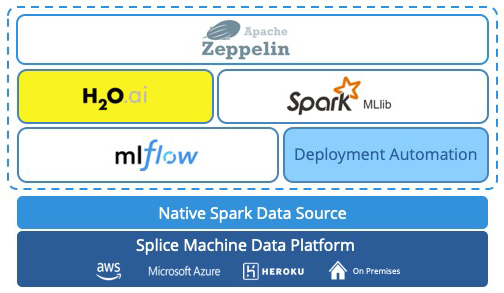 Splice ML Manager is an integrated machine learning (ML) platform that minimizes data movement and enables enterprises to deliver better decisions faster by continuously training the models on the most updated available data. Splice ML Manager provides end-to-end life-cycle management for your ML models, thereby streamlining and accelerating the design and deployment of intelligent applications using real-time data. ML Manager through its tight integration with Splice data platform results in reduced data movement that empowers data scientists to conduct a higher number of experiments to derive better feature vectors with more signal and compare algorithms with varied parameters to build better models in a limited amount of time. Traditional enterprise data infrastructure consisting of separate transactional, analytical and data science platforms does not provide a viable foundation to power mission-critical machine learning (ML) applications. This architecture has latency built-in at multiple levels. First, the model development and training phase requires data to be continuously extracted from transactional enterprise applications. Once the model is built and trained, it requires expensive transformations and aggregations to operationalize the features before any predictions can be made. This infrastructure is also not agile enough to trigger the right action in real time especially where data attributes change rapidly and require the model to be continuously trained on updated data. Take a deep dive look at ML Manager in this demo hosted by Ben Epstein, Machine Learning Engineer for Splice Machine. Industry standard mechanism to rapidly develop and collaborate on data science solutions. Connect with our engineering team to learn about joining our beta program.